Type BB(space)xGB(space)Account Number and SMS to 678 from your Dialog Mobile, or SMS to 0777 678 678 from any other network. 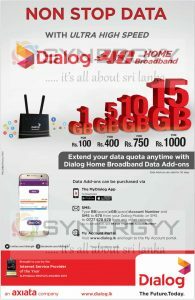 Visit www.dialog.lk and login to the My Account portal. 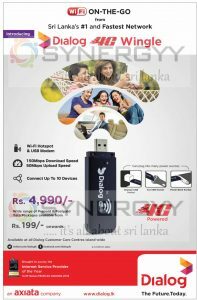 Dialog introduce the new technology of have your wifi on the go with Wi-Fi Hotspot & USB Modem. This USB modem will connect up to 10 devices and 150Mbps download speed and 50mbps upload speed. Mobitel Upahara offers current and retired State Sector employees an iPhone with free data and talk-time for a lowest monthly rental. 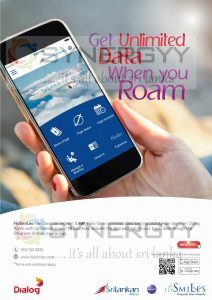 FlySmiLes members can redeem 1,400 miles for an unlimited data roaming package per day from Dialog. Roam with confidence in over 75 countries, activate the data package on your travel date through the SriLankan Airlines mobile app. Enjoy 1000’s of recipes to tantalize your taste buds with food network. Activate food network on your dialog TV just for Rs. 49/- per month or Rs.2/- per day. Type ON <space> Dialog TV Account Number <space> 96 and send an SMS to 679 from your Dialog mobile or to 077 0 679 679 from any other mobile network. Mobitel Upahara brought you to obtain brand new iPhone 5s,iPhone6 and iPhone 7 for current and retired State Sector employees at an affordable price. 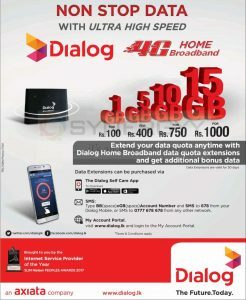 Dialog Axiata offers you nonstop data with ultra-high speed with Dialog 4G Home Broadband service. Packages starts from Rs.100/- upwards and Extend your data quota anytime with Dialog Home Broadband data quota extensions and get additional bonus data. The data extensions are valid for 30 days. By Sms: Type BB(space)xGB(space)Account Number and SMS to 678 from your Dialog Mobile, or SMS to 0777 678 678 from any other network. 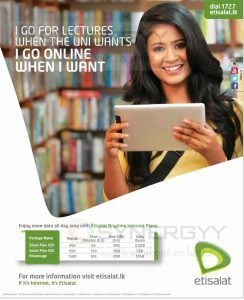 My Account Portal: visit www.dialog.lk and login to the My Account Portal. The Veta App, powered by Dialog and supported by the Ministry of Health and the National Dengue Control Unit is a technology platform for communities to prevent the spread of Dengue. Download the veta App today from your apple store or google play for free of charge. 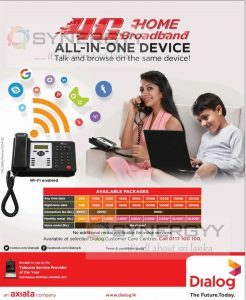 Dialog introduces a Dialog 4G Home broadband all in one device to cater your voice and data for your domestic usage at a lowest price. 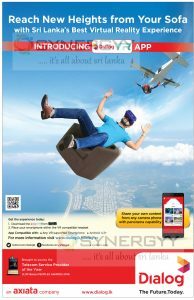 Dialog launched Sri Lanka’s Best Virtual Reality Experience application of Dialog VR app. Start download from your smart phone and place your smartphone within the VR compatible headset. 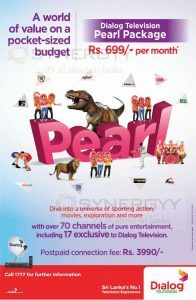 Dialog TV announces a special promotion for the Dialog TV Pearl Package. enjoy over 70 channels of pure entertainments for just only Rs. 699/-, this package including 17 exclusive to Dialog Television too. 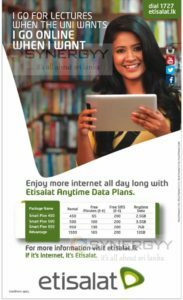 Etisalat Brought you a range of call, message and data package for you to select which suits you well, if you are a light user of call, message and data you can select Smart Plan 450 package and if you are a active call, message and data user you can select advantage plan with 12 GB data. 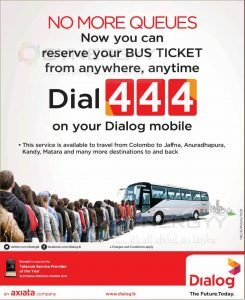 Now you can reserve your BUS TICKET from anywhere, anytime by simply dial 444 on you Dialog mobile. 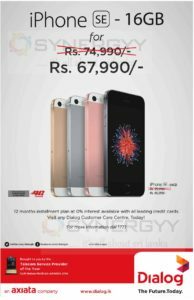 Dialog announces a special price for the Apple iPhone SE range in Sri Lanka. Dialog have obtained authorize dealership for the apple iPhone selling along with dialog networks. Now Dialog has announces a special price package for the Apple iPhone SE 16 GB for Rs. 67,900/- and Apple iPhone SE 64 GB for Rs. 85,990/-. Dialog Axiata announces a special promotion for Dialog Blaster package with free mobile phones, see below details for more information. 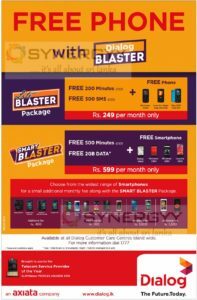 Choose from the widest range of Smartphone for a small additional monthly fee along with the SMART BLASTER Package. Get any of the below mobile by paying extra of 400/- per month along with your Blaster package. Get any of the below mobile by paying extra of 700/- per month along with your Blaster package. Get any of the below mobile by paying extra of 1000/- per month along with your Blaster package. Get any of the below mobile by paying extra of 1300/- per month along with your Blaster package. 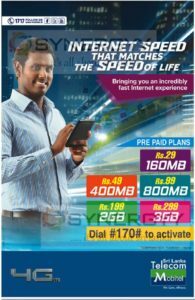 Etisalat announces a special internet packages for Sri Lanka mobile users at a special price and value for money service. Dialog introduce new mobile application of Dialog ViU with iflix to offering thousands of TV shows and Movies. Dialog offers first 2 months unlimited access exclusively for ViU Customers with extra one month trail period for Rs.898/- only. Etisalat Sri Lanka announces an attractive mobile connection packages including Free Minutes between Etisalat to Etisalat, Free SMSs between Etisalat to Etisalat and anytime dates.